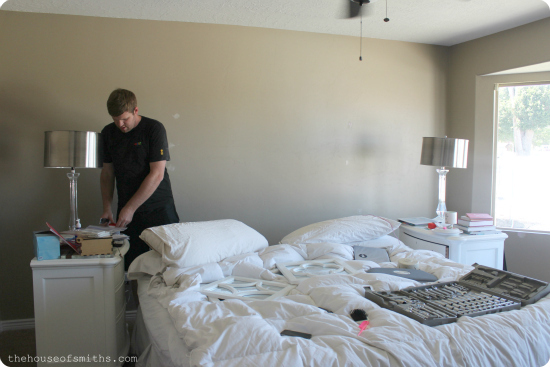 Today I'm sharing some progress that we've made on our little master bedroom makeover. We really haven't gotten that far to be honest, but every little bit counts, right? I don't even know where to start with this dang room. One minute I'm loving it, the next minute I'm "SO over it". What's that all about? I feel like our master bedroom has always served as the "drop-zone" for every pile of laundry that needs folded, stack of mail that has to be sorted, or pile of junk that's awaiting to be donated or tossed. It's constantly filled with clutter and chaos; FAR from the sanctuary that it's "suppose" to be. Well, I've had quite enough of that. I'm ready to have one of those rooms that you look at or walk into and think... "Oh, this is lovely. If I had a spare minute or some peace and quiet, I think I might like to lay my head down on that lovely bed and take a nap, here in this airy, clean, tidy room with no clutter in it." Let's just say... we've got a long way to go. That being said, I'm not getting discouraged. I'm slowly tackling the clutter and trying to plow forward one step at a time, so that I can get closer and closer to that beautiful bedroom both Cason and I have been wanting for so long... and it all starts with white walls and a couple of revamped old nightstands. Towards the end of this past school year a few friends and I put together a combined garage sale with all of the stuff we no longer wanted or needed in our homes. My cute friend Jamie was selling a pair of chunky, high-quality Thomasville nightstands, and you better believe I snatched them right up! When I told Cason I wanted them he did his little eyebrow raise and just shrugged his shoulders. At this point, I think he's stopped questioning my motives. I knew that with a shiny new set of hardware and coat of white, high-gloss paint, these babies could ROCK again... and I was SO right! They looked AWESOME in our bedroom and gave us all the much-needed storage that we had always wanted. Once I got those fresh new nightstands in my room, I was bound to brighten up the entire space. The only problem was... I had NO idea what color to paint it! We still hadn't decided on what our new bed, bedding, pillows, or potential other furniture would look like in here... so I wasn't ready to commit to any particular shade. So what do you do when you can't make up your mind? Paint everything a pretty, clean, white! That following Saturday, with my 5 year old under Grandma's watch, Cason and I got DIY'n with Emberly and Jocelynn, our twins. 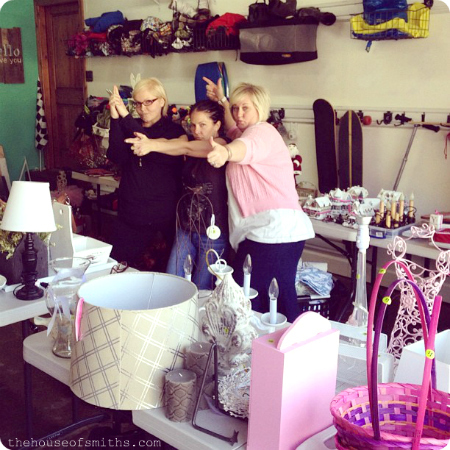 They were so happy to help, and it was really nice to spend some one-on-one time with them doing what we love. Since we have plans for a rolling door outside of our bathroom, we removed the molding from around the door frame and took our TV down off the wall to get ready for paint. After pushing everything into the center of the room, dusting the walls, baseboards, and taping off, we were in business. And before you ask... yes, we actually let them help prime and paint (with barely loaded paint rollers, so there were no spills or splatters). 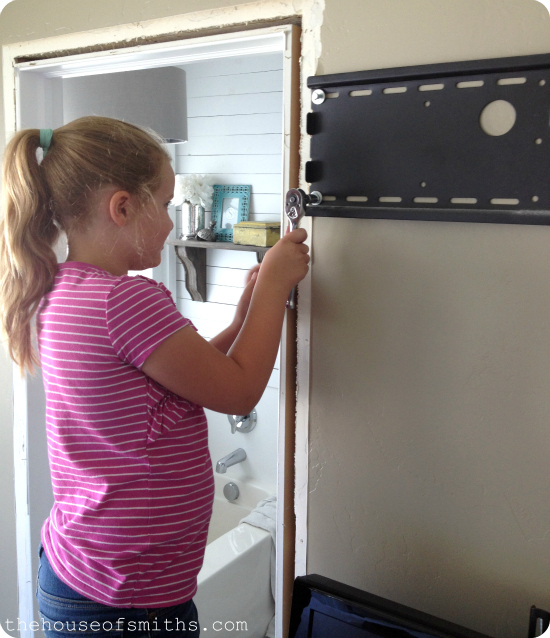 I think the important part of DIY'ing with small kids, is making them feel like they're actually helping, and keeping them busy so they don't get bored... even if it's just something small. Isn't it GREAT!? Don't you LOVE it!? Okay, okay, I know, it looks like a sterile, over-sized hospital room... but seriously, for me to be able to even entertain the thought of new exciting colors or design, I HAVE to begin with a blank canvas, so actually, this was PERFECT for me! 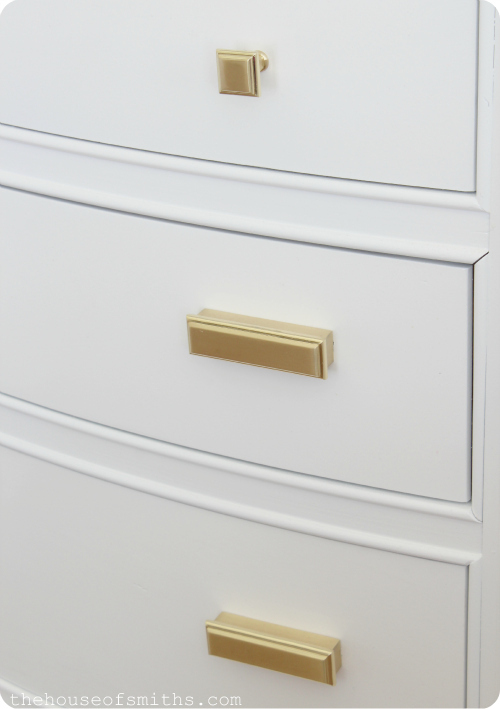 I'm not sure how to explain "the exact style" I'm going for in this space, but I know what it looks like in my head... and sleek, simple gold hardware for those pretty, new nightstands was at the forefront of my mind. 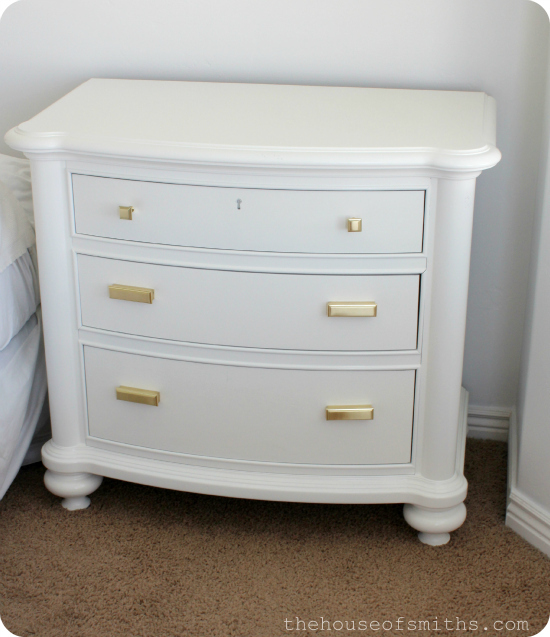 Go ahead and tell me that the mix of traditional lines on that stunning nightstand, paired with the high-gloss white paint and modern, gold, trendy hardware doesn't get your design heart beating faster. I know it does mine. And here's what it looks like all together, with some other little trinkets, including a few that I talked about in our last post, you know, the clearance decor stash I snagged from Target!? Knowing me, I'm sure that things will still switch around a lot with the decor once we make up our mind with other design decisions in this room, but I'm THRILLED with how even just a simple coat of white paint can change my attitude about this space! How do YOU feel about your master bedroom? Is it a peaceful, restful sanctuary away from all of life's daily stresses? Or do you share some of the same frustrations and challenges we do? Love it! What is the name of the paint? walls and trim. I love the end tables! Somewhat Hollywood Regency, to me. LOVE the white and gold! These look great! I have been looking for night stands exactly like those to paint. I have searched many garage sales and have not found them yet. :( Hopefully soon! So cute! I love the white! I've been wanting to paint my night stand, but I'm not sure what type of paint to use. Any advice? can you tell me what products you used to paint the end tables? 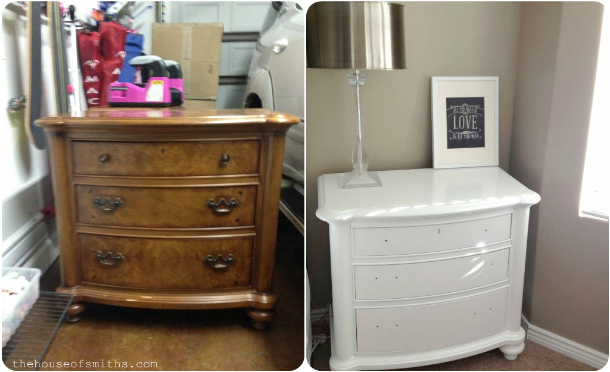 i have a couple "old school" dressers i'd like to redo.... and yours are so lovely! 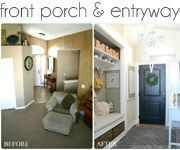 I can't wait to see what you end up doing with this room, I love your style and love the blog, I come back all the time to get inspiration! 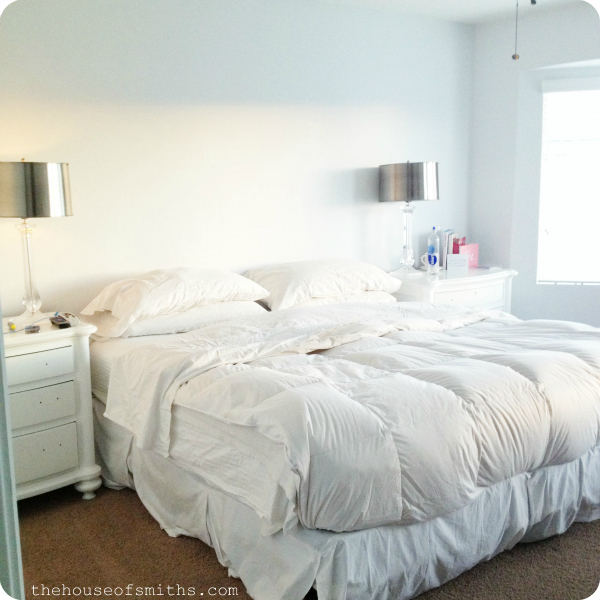 It seems like I have a vision for every room in our home...except the master bedroom! I know I want white bedding. But that's about it. and of course your nightstand looks tee-riff! super elegant with those lovely pulls. I recently painted our master bed and bath a blue-grey and I adore it. It feels so serene and every time I pass it in the hall I peek my head in for a look. Cap that with my recent absolute score of the century: *huge* $35 lamps from HomeGoods and I'm a happy girl. Thanks as always for sharing, you really rocked this one. 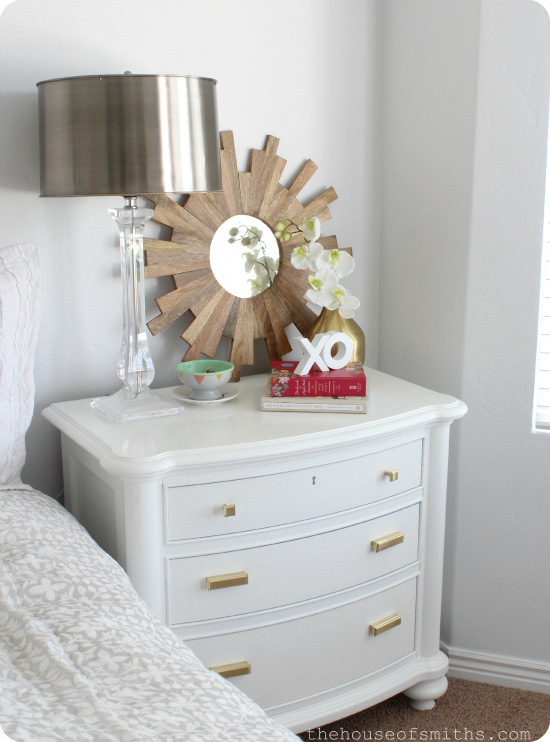 Love the nightstand tables! Pretty brave to paint with no drop cloth on carpet. 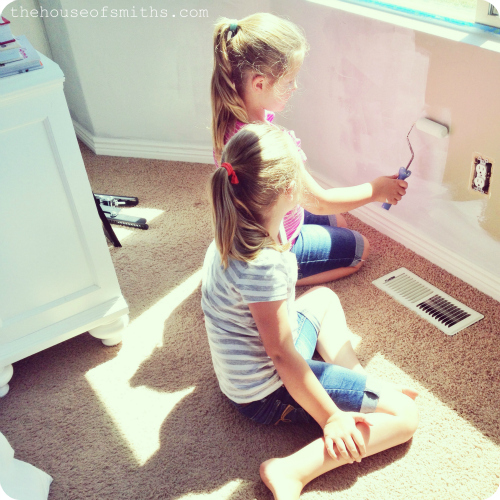 I love that you have the patience to let the kids help, that is parenting done right. Gold is back!! We just bought a house, so our master bedroom is lacking everything! Even the queen sized bed looks lost in all the space that we are not used to. I have no idea where to even start in there!! I love how it turned out. I recently read that most people have blue tones in their bedrooms and blue helps to calm down and sleep better. So if you are looking for a paint color, you might want to consider a light blue. We have it on one wall in our bedroom and I can really sleep well most nights. I really like your wood sunburst mirror and the gold vase! I have recently changed some details and added nightstands to the bedroom as well, but on the dresser (the part you don't see in the pictures on my blog, haha), I have that collection of things to sell, give away and donate like you mentioned. Most people have all those things in the bedroom, probably because none of your guests will ever see it there and most people really underestimate the effect of that mess on your sleep. Well, I have to clean that up. Very soon (summer holidays are only 2 weeks from now). But I have a good feeling because I've already gotten started, just like you! Our master bedroom looks like that last shot of yours, almost constantly! I finally got fed up last weekend, folded all the laundry AND put it away (shocking, I know), dusted everything, unhooked the whole dang computer and rewired it all so the cords are mostly hidden (why can't men do this in the first place?) and finally had a really good talk with The (color-shy) Man about my vision for the space. Pop on over to my blog (tomorrow) for a rundown of my wish list! LOVE the gold accents!! I would love it if you would share at my Work it Wednesday linky party!! Great Post. I love reading that someone else has the same problem I do. I hate our Master Bedroom and can't wait to change it all up. But first I have to finish up all the other rooms in my house. Question: When you painted your side tables, did you sand down the gloss that was on them before, or did you just paint over it all with the white high gloss? This is something I want to do to ours as I love the side tables but hate to think I have to sand it all down. Ya. We've got the same problem in our bedroom with stashing everything in there that we don't want to look at in the rest of the house. I'm constantly dreaming of making it more serene. I'm loving what you're doing in your room. Especially that rolling door. What color white did you use? I LOVE this. Since there are so many choices of white paint, would you mind sharing the name of the paint you chose? First let me say that I love reading your blog! Quick question, to refinish those beautiful tables did you do some serious sanding, then a good primer, then the glossy paint? I inherited a beautiful credenza table from my grandma and it is a quality piece with that glossy wood (like your nightstands). Just wondering, what is the best way to refinish it? I don't want to ruin it by any means. Thanks for the help!! Our room looks like a storage facility with books, magazines (can't bear to part with them) clothes that need donating, odds and end, and storing 2 laundry baskets because we haven't figured out where else to store them. We already have picked out new lamps and the bedding, we just have to get started on painting and organizing and right now in the heat of summer it is too hot to spend much time up there during the day. Can't wait to see your finished room. 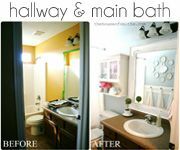 I know it will be as gorgeous as all the other DIY rooms you have completed. Where did you get your bedding? So pretty! What brand, color and finish did you use on the nightstands? I've made 2 recent white errors! I need white help! I am inspired. My master bedroom is also a disaster area. We moved in November and still have no furniture (thank God for California Closets or I would be living out of a laundry basket). I have an ironing board for a nightstand and everything else sits around the room in little piles. We haven't done anything because we haven't completely made up our minds. At this point, something is better than nothing, right? I like that you are taking baby steps and are willing to share progress and chaos. Keeps it real and reminds me that we can take baby steps too! Thanks! Thank you for keeping it real! 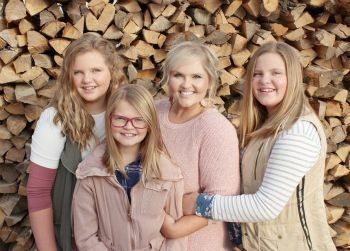 We have 3 little ones about the same age as yours and a teenager. Our "sanctuary" looks like your before on a daily. I love the pile of 'stuff' in the last photo as I have little 'caches' of stuff like that myself!! The nightstands are just beautiful, they look brand new! I LOVE the hardware. I painted my MB chocolate brown-everyone said that I was crazy, but I love it! It is very soothing to me and it matches with everything! It also helps that I have three good sized windows in that room. Hi Shelley, First of all I want to tell you that I just love your blog and enjoy reading it and looking at all your beautiful makeovers. Your family is adorable too! You are not alone. My master bedroom is faaaaaaar from the sanctuary we want it to be too. I have the same issues with clothes being piled on the bed, papers and mail stacked on top of my hubbys desk(that desk has to get out of there). And just sort of a dumping ground for STUFF!! So I can definitely relate to your issues. Dont laugh, but I started painting the room 2 yrs. ago. An ivory color, which, by the way, I dont like.The yellow undertones are not to my liking. So, There the room sits,half painted. SIGH.Our ceiling is high, and my hubby is afraid of heights, so our room now is half ivory, and the ceiling is an awful builders grade white.I do however love your white walls. So clean and fresh. I adore white anything!There are some pretty blues and green grays out there, but I still always lean towards white. Love it! I do have a couple questions for you Shelley. 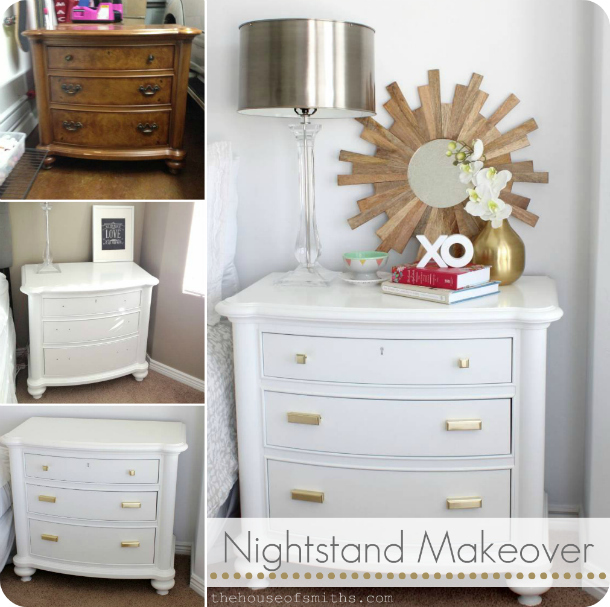 What color white did you use, and how did you get those beautiful nightstands so professionally looking painted. I painted a nightstand and the top looks like orange peel. Kinda bumpy and not smooth and pretty like yours.LOVE the hardware too, by the way. Its funny how we are all liking gold again. Have a lovely day, and happy decorating! Wow what a difference the paint and new handles made!! Thanks for this post. Our master bedroom is always the drop spot for stuff - clothes to fold, give away piles, and currently my hubby's office. Prayerfully your motivation will spur my own motivation to 1) work on our bedroom to make it the oasis we want and 2) work on finishing off the shed that will house hubby's office so we CAN complete our bedroom. I absolutely LOVE those nighstands!! You've inspired me to repaint mine! They are actually pretty similar to yours and have that old orangy stain that all furniture from the 90s seems to have. Can't wait to see what colors you bring into the room!! And I can totally relate with the bedroom becoming the drop zone for everything: clutter, piles, laundry that never actually gets folded or put away... Hang in there! 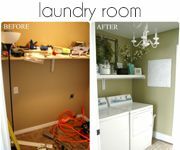 Sprucing up your room will make you more motivated to keep it a "sanctuary" instead of a drop zone! Love it!!! I've been jonesing to paint my wood nightstands.... but have hesitated. You've made my mind up for me - I'm doing it! Why is the Master bedroom always the last to get the love! Our's has the necessities but no real 'style' either. 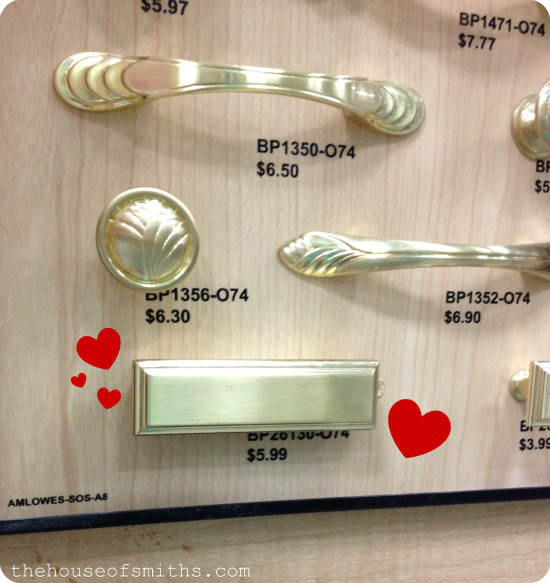 :) I totally dig the white and gold hardware!! 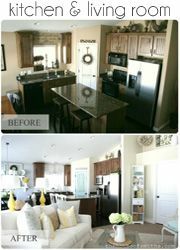 I love how you can invision the potential of a piece of furniture and resurrect it!! AMAZING!! LOVE LOVE it!! PS I feel like I haven't seen you in FOREVER!! Miss you guys! Girl, I totally know how you feel! 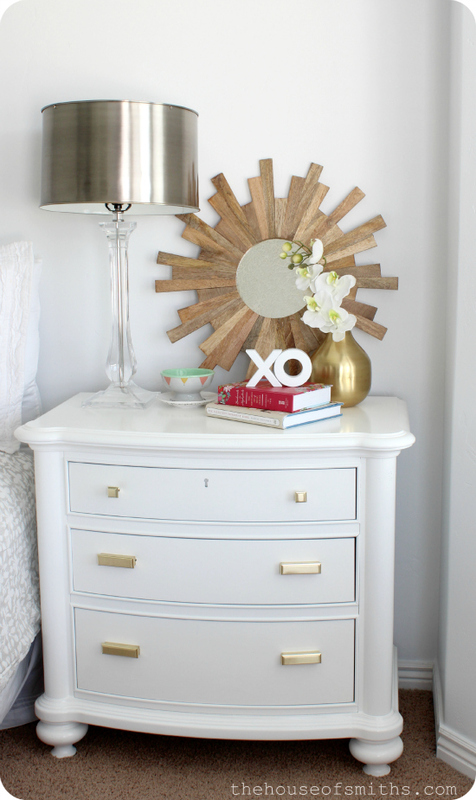 I just revamped our master bedroom (shared the reveal on my blog this week, actually!) and I feel so much better having a space I love. Those nightstands turned out so beautifully and I LOVE where your room is headed. I'm sure it will be gorgeous! After reading the comments, I feel to ask a question: Don't people have filing cabinets anymore? Or a file drawer? That is where the 'mail' goes after the entry-way-sort-into-the-trash/recycling, and the 'do it next' pile/notebook on the desk. Some stuff goes into the Family File. Mail never reaches the bedroom. Small steps are good, especially the ones that seem to clear your mind, allow for the future, and are easy to do.